Here you can see how most of the British media kept silent, failing to warn British parents of the danger to child health safety from our government's and our Department of Health's unsafe vaccines and vaccination practices. "No matter who wins in Pennsylvania .... the next President of the United States will support research into the growing evidence of some link between vaccines and autism." Wakefield's courage and willingness to speak out, alongside very few others, contrasts with the silence from the medical professions. It is no longer wise or safe to entrust your children's health to doctors and their professional bodies. The British Medical Association is a trades union. As such, its main interest is not yours or your child's but how much money it can get into its members' pockets every year from government. Its rôle in the vaccines-to-autism and related child health safety issues, through its control over the British Medical Journal is something not to be allowed to be forgotten. If you are concerned and want to do something, tell others and circulate this. Ask them to tell others and to circulate this. Contact your political representatives. Demand they tell you what they are going to do to protect child health safety in your country. If you are in the UK and want to contact your political representative, to make it easier, use www.writetothem.com. The following is from an exchange of emails with The Observer newspaper (London, England) in April 2008 during the General Medical Council's witchhunt into Dr Andrew Wakefield over his personal and lonely stance for child health safety worldwide. If The New York Times and other US news media can report the dangers posed to US kids, The Observer, and you in particular, refuse in the clearest of terms to report those same dangers when posed to British children. So that you can have no excuse for not writing about all of this, I provide for you a detailed summary and other details. Much more is available with documentary substantiation. The British MMR child litigants claims are now being shown to be justified by events in the USA and other information obtained under Freedom of Information, but The Observer will not publish this. The Observer is in a unique position amongst the British media because it has been given privileged access to detailed information over many years. If you want to ignore this, that is up to you. And with 1 in 116 British children on the autistic spectrum (*), you stated clearly in your email that you would not print correct balanced sourced and referenced information and you have ignored the news from the USA on the risks to British children. You instead prefer to take your information from the commerce and industry funded Science Media Centre, whose Director, Fiona Fox, is prepared to promote unusual perspectives: Genocide? What genocide? How historical revisionists became biotech apologists (5/4/2004). I also commend to you the further information appearing later in this letter. The implications of your various remarks are considerable. From other comments you make and the singular lack of coverage elsewhere, it seems the position in other British media is the same as at The Observer. What it means is that regardless of how much harm is caused by the drug industry to British children or any other British citizen, if The Science Media Centre can find an industry friendly "expert" (and in this case anonymous ones), any story can be blocked, that harm will go unreported in The Observer and, it seems from what you say, in many other British media outlets, leaving the British public without any news of the dangers. "The Science Media Centre actually praised Barbara's piece for being was 'extremely balanced' adding 'she clearly concedes that this issue can be seen from both sides'." The fact that a national news media organisation like The Observer considers "praise" from an unelected publicly unaccountable industry funded lobby group like The Science Media Centre is more important than publishing balanced objective accurate information which can and will save children's' lives and protect their health is a tad over the edge. I am sure I am not alone in thinking that." The New York Times' piece is about Hannah Poling and her autism being admitted by US government experts to have been caused by vaccines (and not simply by MMR but by vaccines in general). They conceded her case in the Federal Court rather than fight it and have a court decision. This story has been reported over many weeks and on numerous mainstream print and broadcast media in the US including the popular Larry King Live, which I am sure people in the UK have heard of. It is also reported that the Hannah Poling case is not isolated and that similar cases could be common, with as many as 1 in 60 sharing the same predisposition to react adversely to vaccines. The Observer is failing to do its job when doing that would, as we can see below, save British kids from illness and injury. Your comments show we have the drug industry not just dictating the health agenda but writing and editing the UK's medical health stories, taking over at The Observer from journalistic duty, ethics and public obligation. I and other professionals including some in medicine and beyond share these child health safety concerns, but it would seem not The Observer. Your Home and Social Affairs Editor, Jamie Doward, has documented information on all of this accumulated from various sources over the past 4 years and more. As The Observer's editors prefer to take their information on science and medicine from The Science Media Centre, the public need to be told that is what is happening in the British media. And with that backdrop, you tell me in clear terms you refuse to publish correct information because you worry there is a risk one person in 55 million in England and Wales who would already have to be seriously ill, might in the present day die from measles. The information you will not publish would balance out what The Science Media Centre say. You have been provided with hard factual evidence showing the risk of that very low chance of measles mortality. It is 30 to 60 times lower than the chance someone in the UK will be struck by lightning. Instead, you come back with three anonymous so-called "MMR experts" who cannot get basic facts right. I demonstrated that was the case - backed up by government figures and peer refereed journal reference. I drew your attention to the the Hannah Poling case and the coverage it is receiving in the USA in my email of 3rd April. You ignored that email. My 3rd April email was entitled "82% Say Vaccines Cause Autism & Wakefield Sent the Money Back". To that email I linked the US audience poll 82% figure from The Larry King Live site. 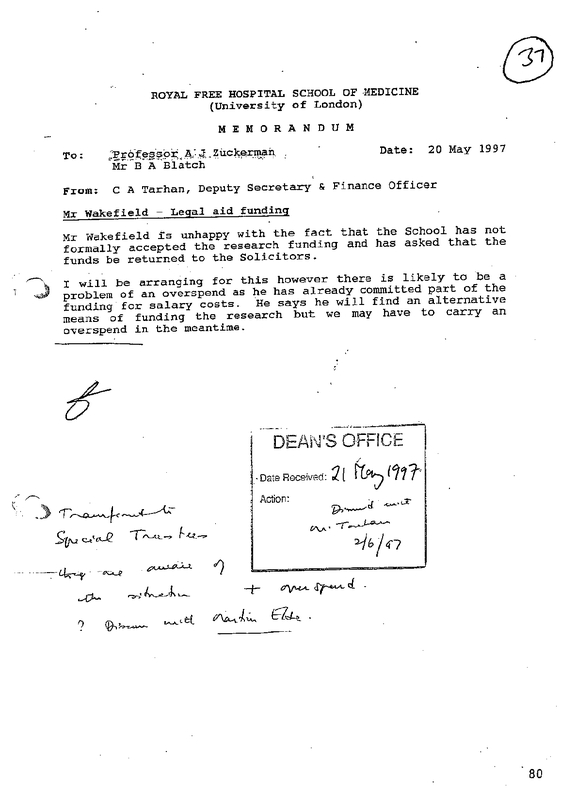 I also attached the May '97 internal memo from The Royal Free's Deputy Secretary and Finance Officer Tarhan to Dean Zuckerman. Tarhan reported to the Dean that Wakefield was so fed up with the shenanigans at the Royal Free that Tarhan was already sending the legal aid money back. Tarhan also reported that Wakefield was going to find funding for the autism work himself. That memo is in the GMC proceedings and I have it under FOIA together with many of the documents and other evidence The Sunday Times had either withheld or failed to disclose in 2004 when it attacked Wakefield and then and since. But we hear not a word of this in The Observer. And The Observer has not reported the correspondence and other documentary evidence disclosed this week in the GMC. Contrary to Lancet Editor Dr Richard Horton's evidence to the GMC was that he did not know of Wakefield's paid involvement in the MMR litigation, Horton had detailed correspondence in 1997 disclosing that involvement The correspondence was with Richard Barr, the solicitor who was working on the MMR litigation with Wakefield to help all those seriously injured British children.. This correspondence was considerably in advance of Horton's February 1998 publication in The Lancet of the Royal Free's paper containing the interpretation that MMR vaccine is associated with autism cases involving inflammatory bowel disease. "The investigation has found that when [Wakefield] warned parents to avoid MMR, and published research claiming a link with autism, he did not disclose he was being funded through solicitors seeking evidence to use against vaccine manufacturers. " Now we know from this that Horton's claims do not stand up and with them, those of The Sunday Times fall as well. But of course, not a word in The Observer, which is in thrall to The Science Media Centre, as you have so ably demonstrated. Professor Sir Roy Meadow is now notorious for his evidence falsely condemning mothers around the world for killing their children. This includes the Sally Clark case where vaccines are directly implicated in the cause of death, as revealed by Neville Hodgkinson in The Spectator, (What killed Sally Clark’s child? | The Spectator 16 May 2007 ) but which were specifically discounted by Professor Meadow in his evidence, despite sitting on the joint CSM/JCVI vaccine safety sub-committee with Professor David Salisbury and others to approve the MMR vaccine. Another free of charge helper to Sunday Times journalist Deer was Glaxo Wellcome funded Fellow and active British Medical Association member, Dr Evan Harris MP. Harris has advised and assisted Deer up to the present day, including attending the Wakefield GMC hearings with Deer. when challenged a statement was issued to The Telegraph's Joshua Rosenberg on Judge Davis behalf stating "The possibility of any conflict of interest arising from his brother's position did not occur to him." on 15th March 2004 Dr Evan Harris launched an unprecedented and defamatory Parliamentary attack on Wakefield and his Royal Free colleagues and to which not one of Harris' Liberal Democrat colleagues contributed. the problems with Pluserix MMR were known to the supplier, Glaxo company Smith Kline & French Laboratories Ltd from the experience of its introduction to Canada, in 1986, where Pluserix was marketed under the name "Trivirix"
the high levels of British adverse reactions to the vaccine were apparent and known about at ministerial level in 1990, as shown by ministerial correspondence (which I of course have copies of). Then, after 10 years of government claiming there is no evidence of any link between MMR and autism, we find out the US government has conceded at least 10 court cases in the past 18 years linking autism to vaccines, and one of those cases - the case of Hannah Poling - is now being publicised by the media all over the USA - but not in the British press (with rare exceptions - Melanie Phillips piece "Another piece in the jigsaw?" Saturday, 22nd March 2008). The Poling case is all over US national and state media, with numerous appearances including on the Larry King show. And at the end of this email are the details of the other nine cases of which public details are available (and many cases are still in secrecy under special court rules) and the full text of the Hannah Poling case concession by the US government. And as mentioned above, I also attach a peer refereed published paper setting out the case history of Hannah Poling. If you look at the other 9 cases cited below and take for example of Banks v HHS, you will see that he was diagnosed as PDD-NOS which is also called "atypical autism", and that it was described as "pervasive developmental delay". it shows the US media are more prepared than ever to publish hard hitting factual information when they would not touch this issue in the past. MMR vaccine administered in March 2000. The child was diagnosed with PDD secondary to acute disseminated encephalomyelitis (ADEM). DPaT and HiB vaccines administered in March 1997. Seizure disorder in a child diagnosed with autism. MMR vaccine administered in July 1999. DPT vaccine administered in the 1980’s. Aggravation of tuberous sclerosis in a child diagnosed with autism. DPT vaccine administered in February 1981. DPT vaccine administered in 1974. DPT vaccine administered in September 1979. DPT administered in December 1984. DPT vaccine administered in 1972. Seizure disorder in an young man diagnosed with autism. The court ruled that a diagnosis of idiopathic autism (i.e., autism of unknown origin) was not sufficient to establish a “factor unrelated” that might result in the dismissal of a claim. On Friday, February 22, HHS conceded that this child's complex partial seizure disorder was also caused by her vaccines. Now US taxpayers will award this family compensation to finance her seizure medication. Hannah Poling's seizures did not begin until six years after the date of vaccination, yet the US government acknowledges they were, indeed, linked to the immunizations of July, 2000. (*) the true estimate is higher - 1 in 86. The 1 in 116 figure is from Baird 2006. This was not recalculated for this commentary to ensure people would recognise the figure and not have to wonder where 1 in 86 came from. The Baird 2006 figure is 116.1 in 10,000 (ie 116.1:10,000 (90.4-141.8) for cases on the autistic spectrum..